Pancreatic ductal adenocarcinoma (PAC) stands as the poorest prognostic tumor of the digestive tract with limited therapeutic options. PAC carcinogenesis is associated with the loss of function of tumor suppressor genes such as INK4A, TP53, BRCA2, and DPC4, and only a few activated oncogenes among which K-RAS mutations are the most prevalent. The K-RAS mutation occurs early in PAC carcinogenesis, driving downstream activation of MEK and ERK1/2 which promote survival, invasion, and migration of cancer cells. In PAC models, inhibition of members of the Ras–ERK pathway blocks cellular proliferation and metastasis development. 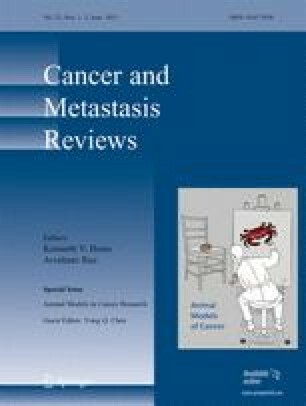 As oncogenic Ras does not appear to be a suitable drug target, inhibitors targeting downstream kinases including Raf and MEK have been developed and are currently under evaluation in clinical trials. In this review, we describe the role of the Ras–ERK pathway in pancreatic carcinogenesis and as a new therapeutic target for the treatment of PAC. The online version of this article (doi: 10.1007/s10555-012-9396-2) contains supplementary material, which is available to authorized users. This work was supported by the Foundation Nelia & Amadeo Barleta (FNAB) and by the Association pour l’Aide à la Recherche & l’Enseignement en Cancérologie (AAREC). The authors thank Sarah MacKenzie for the editing of the manuscript. The authors also sincerely thank Prof. Sandrine Faivre, Prof. Philippe Ruszniewski, Dr. Maria Eugenia Riveiro, Dr. Maria Serova, and Dr. Armand de Gramont for the thorough review and wise criticisms of the manuscript, which participated to the quality of this review. Pascal Hammel is a consultant for Novartis, Pfizer, and Ipsen; Sandrine Faivre is a consultant for Merck, Pfizer, Novartis, Bayer, and Lilly; Philippe Ruszniewski is a consultant for Novartis, Pfizer, and Ipsen; and Eric Raymond is a consultant for Pfizer, Novartis, Bayer, and Lilly. Other authors have no conflict of interest. Ferlay, J., Shin, H. R., Bray, F., Forman, D., Mathers, C., & Parkin, D. M. (2010). Estimates of worldwide burden of cancer in 2008: GLOBOCAN 2008. International Journal of Cancer. doi: 10.1002/ijc.25516. Mazur, P. K., & Siveke, J. T. (2011). Genetically engineered mouse models of pancreatic cancer: unravelling tumour biology and progressing translational oncology. Gut. doi: 10.1136/gutjnl-2011-300756. Bachet, J. B., Marechal, R., Demetter, P., Bonnetain, F., Couvelard, A., Svrcek, M., et al. (2012). Contribution of CXCR4 and SMAD4 in predicting disease progression pattern and benefit from adjuvant chemotherapy in resected pancreatic adenocarcinoma. Annals of Oncology. doi: 10.1093/annonc/mdr617.